Avoid Unwanted Check-Engine Lights: The MAF housing is precision machined from billet aluminum to prevent air leaks and innaccurate readings. *Made for gasoline engines only. Will not work on diesel engines. With the CorkSport Intake installed on the SkyActiv engine, at higher RPM's you may hear a slight ticking from the opening and closing of the injectors. This is completely normal and is what helps increase torque and fuel economy. **How to find your build date of your 2013-2017 Mazda Cx-5. Open the drivers door and locate the vehicle identification sticker. It will look like the picture below. There will be a location which says date shown with the red arrow. That is what you need to find your build date. 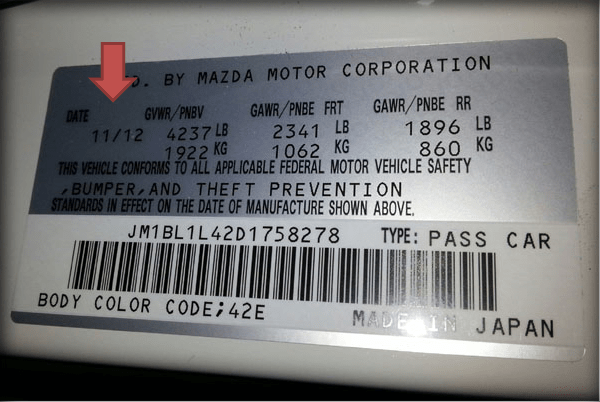 As you can see the on the example below the Mazda was built in November 2012. Awesome upgrade. Very easy to install. Sounds incredible, very throaty. Noticed the increase in torque and even on the downshift, as I have a manual transmission. Worth every penny. is this Emissions legal in all 50 US states? specially California? Is this SRI C.A.R.B. legal for Cali? Very easy to install, worked as advertised (rare these days). Definitely noticed a slight increase in the throttle response and the sound makes me grin like an idiot (which could explain the weird looks). Just ordered the cold air box to go with the SRI and exhaust is next on lists. Question, wondering if this will work with the 2.5L skyactive motors on the 2014? If i order it myself and make the installation with my Mazda dealer on my 2014 Mazda 3 GS, will it void my warranty? Hi Corksport, im very interested in buying this for my 2014 GS but I was also wondering, will it affect my car warranty if I install it? I know this is a Mazda mod Specialty website but just making sure! :) thanks! Is this product California legal? Does this short ram work with 2.5L engine? Do it work with the 2.5L engine? CorkSport Reply:This listing is for the 2014+ models. Check out 2010-2013 section for your correct intake that we offer. Just installed today, took about 15 minutes to install. Throttle response much better, and pulls harder. Excellent Product !!!!!! I just drove 70 miles up to Washington today to pick up the CorkSport Intake for my CX-5. At first, I was hesitant to really get it. But I went ahead and got it after considering... "I just drove up here, why go home empty handed..." Drove home and started the process of installing. I finished about 15 minutes later and it was a success! No error codes no nothing. Tell you what, I OPENED up my throttle from 0-70mph, and I was EXTREMELY impressed. You def. HEAR the difference and FEEL the difference! Thank you CorkSport!!! Still waiting to see improve gas mileage? from what i see now it is a little less MPG. Definitely feel more power and even more using trip-tonic shifter fun to drive. Super quick install, love the ability of customize all of the components for the intake. Well manufactured and quality item, what I've come to expect. The car pulls much harder than before and looks great! Anyone have any real world feed back on what affect this has on MPG? i was just wondering if you guys noticed any changes to your MPG after this SRi mod. Install was easy and the results were great. First mod I've done and I enjoy the subtle roar my car makes now, as well as the power gain. Wonderful product! Great product! One of the best SRI's I've ever used. Noticeable gains with this as my only performance mod to date and the sound is amazing! I went with everything black and the MAF color as red and it looks really good! Great job CorkSport! Fantastic product! Super easy install, looks, performs and sounds great. If I had to be picky I would have liked the silicone to be the same shade of red as the other two components, but its such a minor detail. Definitely a quality product. It was easy to install and you can feel the difference. I love it and its a great addition! Do you guys sell the filter only? Is it require an oil after get cleaned? Or just wash with water and then install it? The intake does not have an EO # for california. 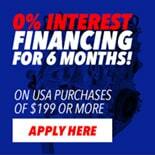 Looking to finance your parts purchase and want to get 6 months NO interest on any purchase over $199? Click on the image above for more details.